A great deal of thought goes into designing cots to keep babies safely in. When it comes time for a toddler bed, it’s all about making sure they can get safely out! 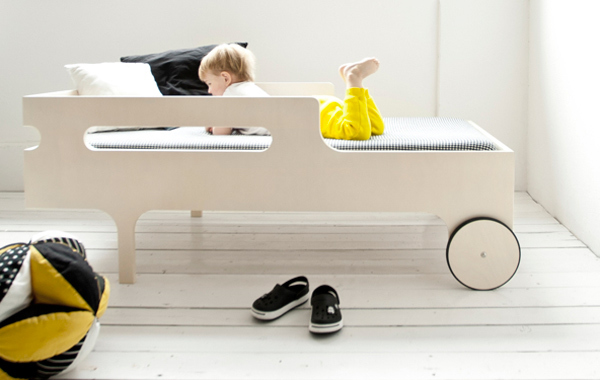 The R toddler bed from Rafa Kids is designed with just that in mind. With its clean lines and modern aesthetic, I’m sure you won’t be surprised to learn it’s the rather fine work of a talented architect couple. Agata and Arek Seredyn, from The Netherlands, originally created the bed for their eldest son, but decided to branch out into furniture-making when it drew so many comments – and requests for similar beds – from their friends. Here’s the things we like about it. Of course, there’s the simple beauty of the bed. But look closer and you’ll see all the thought that has gone into the design. Like the wheels, which are sure to launch a thousand toddler race car dreams. They’re there for that, it’s true, but they are also meant to make it easier to move the bed from here to there, as the whim strikes you. The holes in the base of the bed are obviously for ventilation, but are also designed for fun play when the mattress is outdoors being aired. And those elevated sides at the head of the bed? Yes, they are there for safety to stop your toddler rolling out, but also for impromptu games of peek-a-boo at bedtime. We especially like how the Seredyns refined the bed, after carefully observing their son over time, to make sure it was super-easy and super-safe for a toddler to climb in and out on their own. If your toddler happens to share a bedroom with an older sibling, you might also care to know that the R toddler bed is designed to fit perfectly underneath the equally stylish F bunk bed (below), meant for children aged six and older. It has a ladder on both sides for easy placement in a bedroom. All the beds are made in Poland from European Birch plywood and finished in non-toxic Scandinavian water-based lacquers. 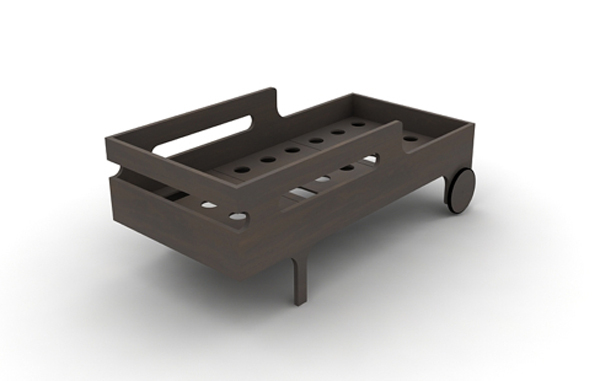 The R bed is available in whitewash or chocolate and costs €550. The F bunk costs €1150. Love one or both and need them right away? Contact Rafa Kids to enquire about shipping to Australia.